This versatile set can be used as either a student Landforms dictionary or as a Landforms Coloring Book – it is your choice! I have included a cover for each, so you can use it how it suits you best. 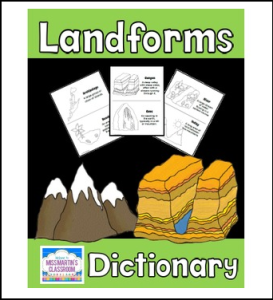 Your students will love putting together this Landforms Dictionary and using it as a resource during their Landforms Unit! If you have any additional questions about this product, please visit my “Ask Me a Question” tab on my TpT store. Thank you for looking!